We were never a “family game night” kind of family growing up, but I knew I wanted to change that when I had kids. The question became where to start and what to play. 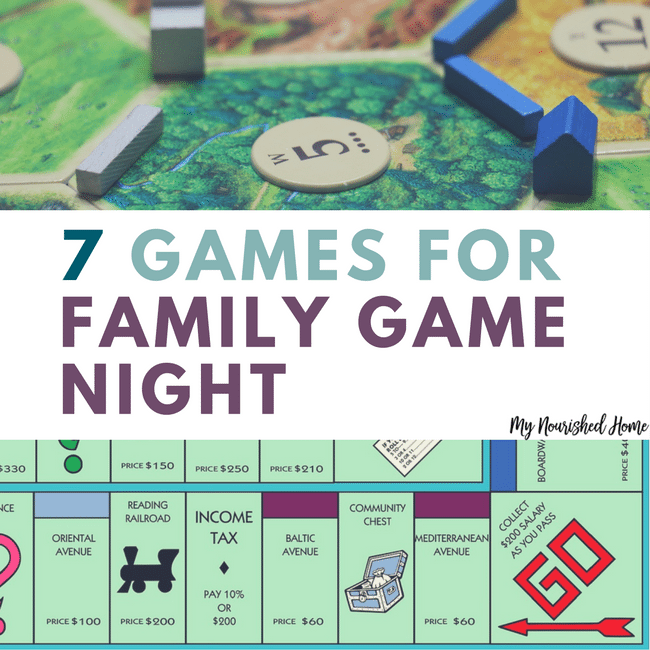 Through a lot of trial and error – and some really bad games – we have finally come up with our favorite games for family game night! Some are more serious, some are more active, and some are more skill, but they all have one thing in common – laughter. In fact, most times it’s the laughter that we remember more than the actual games. Here’s what’s on our family game night playlist if you need some gaming inspiration. If you purchase through affiliate links in this post, we get a small commission at no additional cost to you. Thanks for supporting us while we create free content year round! Early in the evening, the deck of cards is all about Family WAR. It’s a simple enough game that helps the little ones with their number recognition and sequencing skills but is still entertaining enough that the teen sticks around. After the youngest go to bed, the deck of cards is perfect for a round of Rummy or Blackjack. We like to collect decks of cards when we go on vacation because it always brings up memories when we sit down to play with them on family game night. If you’re in it for the long haul, break out the Monopoly board and divvy out the dough. This family classic can take hours to play, but it’s fun for all. There are also updated themed-versions now that can appeal to everyone. If your youngest children are still little, you might opt for Monopoly Jr. instead. Classic Mario Kart on the Wii is one of the most exciting family racing games around. Pop in the disk, grab you steering wheel, and pick your character and car. As you race each other and zip around the course, you’ll find that everyone is a lot more competitive than they thought they were! Adding a technology twist is a great way to make sure that everyone (including teens!) is excited about game night. This game was first published in Germany in 1995 but has become more popular with mainstream crowds in the last few years. 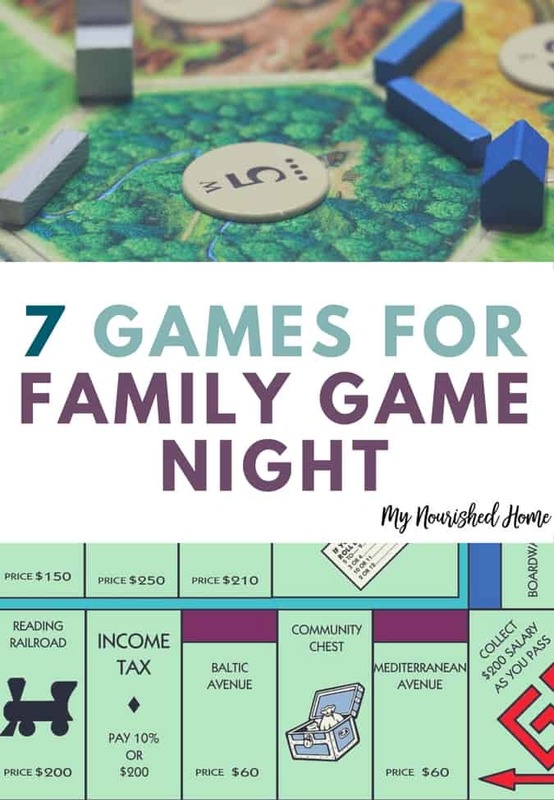 It’s a multi-player game for up to six players (if you add the extension pack) which makes it ideal for larger families as well. Players build settlements on Catan and trade resources to help their colonies thrive. Intended for older players 8+, it can take anywhere from one to four hours to complete a game, so start early in the evening. Everyone can draw – although some better than others, but that’s what makes Pictionary so much fun. All you need to play is a list of words, a large pad of chart paper, a marker, and a timer. If you get the pre-made Pictionary game, it comes with everything you need to get started. From the Kids Edition to the Family Edition, Apples to Apples has been a household family game night staple for years. Since it usually takes less than an hour to play, it’s perfect for nights when bedtime for the littles is looming. The original game is best suited for those 12 and up, but the Kids and Junior editions are ideal for younger players. For less than $20, it’s a great game to add to the line-up. Ready for Family Game Night?! So, grab the snacks and set up the table, because this family game night is about to go down. Prepare for laughter, some friendly competition, and a whole lot of family bonding. After all, it’s not really about the games at all – it’s about the memory making.